Every user can log time on cards to track the pure time they spend on a given task or a subtask. 1. How to Log time? 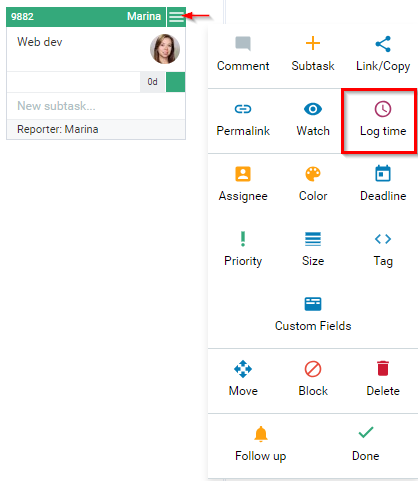 There are several ways to open the Log time panel and enter how much time was spent on a task. Right click card to open the Context menu -> select Log time to open the Log Time panel. Open the card and access the Log time panel from the card settings icon at the top right corner of the card -> select Log Time. Configure your card settings (check mark: Show logged time) to display logged time on the closed card view and access the Log time panel just by clicking on the Log time icon. Choose the card or subtasks to log the time against (img.1). - > You can either choose a subtask or the card itself (1). Set a checkmark and enter the time metric (Example: 1, 1.5, 1d 2h, 1.5d, 20m) in the Log time field (2) -> select the Log time button to enter the time. 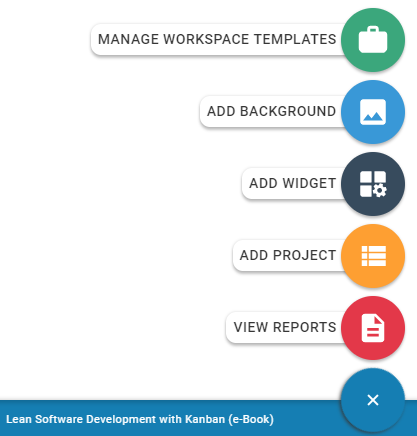 The time you have logged will be displayed at the bottom of the panel (3). Date: You can even log time in the past (if you forgot to) or in the future (if you anticipate) depending on your particular use case. Description: The description field is optional - here you can insert a work-related comment. - If you want to edit the time that you have logged, please click on the Edit icon (the pencil) and change the value in the Hours box. Don't forget to click on the check mark to save your changes. - If you want to delete logged time, use the Trashcan icon. 3. How to Track Metrics? All the log times you enter can be found in the metrics section of the card by column. The metrics tab can show you how long a card has spent in each column and whether the time has been logged for those elapsed times. Account Owners and Workspace Managers can generate reports about logged time for a specific board or groups of tasks/users by setting up a custom search in reporting. Choose the View Reports option available through the retractable menu in your Main Dashboard and run a Timesheet report. Important: All Regular users can check how much time was logged on every task via the My Queue and Worklog feature (check p. 5). You can choose to see how much time has been accumulated for: today, yesterday, this week, last week, this month, last month.